Socialpunk was written by Monica Leonelle. It is the first book of the Socialpunk Trilogy. Do you want the short version of my review? The book confused me. I think I liked it. I think I have to read book 2 before I can tell you if I liked book 1. Check back with me in a few months??? Ima would give anything to escape The Dome and learn what’s beyond it's barriers, but the Chicago government has kept all its citizens on lock down ever since the Scorched Years left most of the world a desert wasteland. When a mysterious group of hooded figures enters the city unexpectedly, Ima uncovers a plot to destroy The Dome and is given the choice between escaping to a new, dangerous city or staying behind and fighting a battle she can never win. When I read books I tend to avoid any types of reviews or excerpts before I start. I usually don't read more than the brief descriptions I include in my book reviews (like the one right above). I don't like to know much about a book at all when I start it. I like my opinions and ideas about the story to be my own, completely. I went into reading this book a little differently. 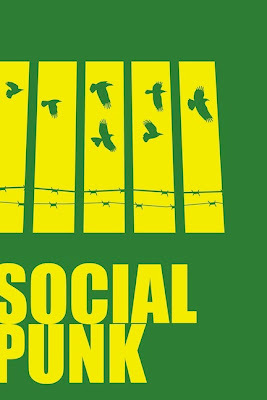 I was invited to be a part of the Socialpunk blog tour. I received an e-mail from the author and was given quite a bit of information about the book. I was sent an excerpt (which can be found in the description on Amazon) and given a pretty good idea about what the book would be like. The excerpt gave me a completely different idea than the above description. The concept had me completely intrigued and I was excited to see where the author would take me. I hate to say that I feel like I spent most of the book feeling confused. I went into it thinking it was going to be about a simulated/virtual world turned "real" (which is how the excerpt seems to start out the book) but then it turns into something totally different (the description). I finally got to the point where I decided to give up deciding virtual vs. real. I stopped trying to pick everything apart. I stopped trying to decide who was who... and what was what. When I did that I started to enjoy the story. Do I love Ima? Not really. She's a little too naive for me... and a little too easily swayed. I think I could say my favorite character is actually Vaughn (the hero? maybe? I like to think so). I think I'd have to choose Vaughn because (like me) he's really confused with what's going on with Ima, and The Dome, and reality... but he can't turn away from Ima either. One thing that didn't surprise or confuse me? The last sentence of the book. Totally expected it... but now I'm dying to know the response. Well played Ms. Leonelle. You can be guaranteed I'll be buying Socialmob (book 2) when it's released this July. Disclosure: I was included in a blog tour for Socialpunk and received a digital copy of the book from the author. All of the opinions expressed are my own.